Raleigh Check cashing offer Bill Payment Services as Authorized Bill Payments Center (CheckFreePay). With this convenient service, you can pay virtually any type of bill, to a mortgage payment in a matter of seconds. 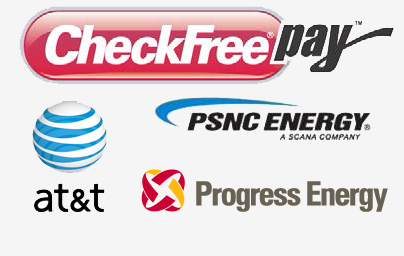 Payment categories include Progress Energy, AT&T, PSNC ENERGY, City of Raleigh,Time Warner Cable/Satellite companies, Cellular providers, Municipalities, Retail credit cards, Insurance companies, Finance and many more! Same day, next day and expedited payment options. MasterCard and Visa card bill payments. Prepaid cellular and credit cards. Personal checks (will be accept as EFT). How can I pay a bill in Raleigh?